At the start of the play, Hilary is in her early 20s, trying to get a job at a research institute attempting to crack ‘the hard problem’. She seems almost child-like naive and a tad diabetes inducing, which is especially interesting when in a later scene, it turns out she wasn’t that way back in school. Also, for someone who claims to be ‘good’, she has no qualm trying to blackmail an atheist into praying. Hilary’s counterpart Spike who -along with Lucy Robinson’s Ursula – gets the best lines is as over the top factual as she is overly innocent. Both are about as flexible as a steel rod in their scientific and personal beliefs which is a sad thing considering the play spans about 9 years. Spike was a lot more likeable on stage than on the page, thanks to Damien Molony’s ‘what did I say/do now?’ expressions that made Spike come across as actually baffled by some of Hilary’s reactions. He’s still a mean drunk though. The acting was very good across the board, even if Anthony Calf’s American accent was utterly unconvincing and Olivia Vinall sometimes seemed to copy her Cordelia from last year’s King Lear too much. The characters seemed a bit stereotypical; apart from the quite average couple of Ursula the sharp tongued scientist and her Pilates instructor girlfriend Julia, we have the idealistic heroine, the no nonsense scientist, the American finance shark, the eager to please junior researcher, the greedy upstart and the love-struck boss. People’s sympathies for characters and interpretation of storylines tend to be influenced by personal experience anyway (see iceberg model), so considering the subject matter of the play I suspect this to be intentional in order to offer audiences a broad ‘colouring book’ range of people to identify with or project onto. I only skimmed the reviews before the broadcast, trying to avoid spoilers, but it seemed that a lot of the critics had such high expectations in a new play by Top Stoppard or where they wanted it to rank on their personal Stoppard Scale, it was nigh impossible to fulfil them. The only real issue I had with it was that the resolution of a side plot was predictable and a bit of a cheap way to wrap things up after the hour and 40 minutes (no interval which was a good move) had flown by. Unlike the last broadcasts, I’d actually very much like to see this production again. This entry was posted in Live Cinema Broadcast, London (UK) and tagged Anthony Calf, Benjamin Powell, DAisy Jacob, Damien Molony, Eloise Webb, Hayley Canham, Jonathan Coy, Kristin Atherton, Live Broadcast, London, Lucy Robinson, National Theatre, Nicholas Hytner, NTLive, Olivia Vinall, Parth Thakerar, Rosie Hilal, Theatre, Tom Stoppard, Vera Chok. Bookmark the permalink. 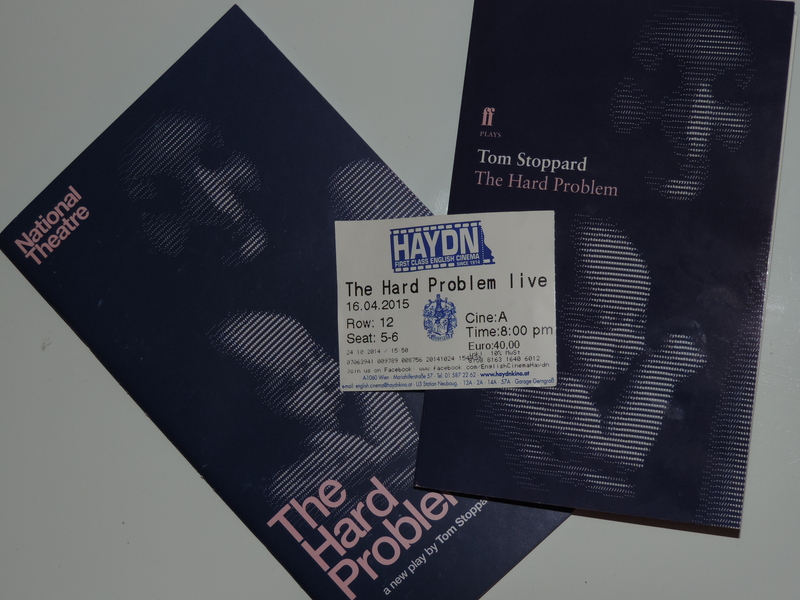 I thought the “hard problem” was quite interesting, liked the fast-paced dialogue between Hilary and Spike (good-looking bloke, too) and enjoyed tremendously the music by Joh. Seb. Bach and the lighting installation above the stage. I, too, would gladly see this play again! As long as her skin didn’t distract you from the actual play 😉 Ursula was funny to boot, so you lucked out there. There’s a cinema chain over here that shows the NT plays at least a month after the live broadcasts and adds subtitles (yuck), but unfortunately they didn’t buy The Hard Problem. I really would have gone to see it again. Re Damien Molony: since I know you like TV series and don’t mind the occasional f-word, try Suspects. It revolves around three police detectives in East London. They shoot one ep in two days and the actors get the storylines and what the outcome of the scene they are shooting is supposed to be, but have to make up the dialogue as they go. Sounds like a recipe for disaster, but is actually really good.